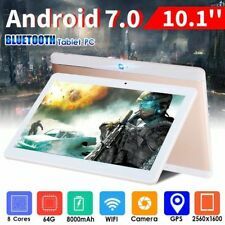 10.1 inch Android 7.0 Tablet PC 4GB 64GB Octa Core WIFI GPS Phone Wifi Phablet . Series XIDO X111 16GB. Sistema operativo Android. Capacidad del disco duro 16 GB. Haremos todo lo posible por ayudarte. Desde que empezamos mantenemos un100% DE VOTOS POSITIVOS en todas nuestras transacciones. D. 2GB RAM and 32GB ROM ,TF Card up to 128GB: large RAM keep the laptop working smoothly,which is equipped with huge storage capacity that you can download whatever you like from network and save them. 1: MTK6797 Deca Core 2.0 GHz;. 3: 256GB ROM. 8 GB di RAM 256 GB ROM. In Più in OMAGGIO per ogni tablet avrai una comodissima borsa in spugna paracolpi e antigraffio, una pellicola proteggi graffi, una penna touch screen e un utilissimo carica batteria da auto da viaggio! Caracteristicas:Alta tecnología y mano de obra exquisita.Memoria de trabajo DDR3 de 2GB.Pantalla IPS HD de 1280x800px.3G integrado, GPS, WLAN y Bluetooth.Estable sistema operativo Android 7.0 LollipopDiseño delgado, óptica de alta calidad.Cámara dual (frontal trasera equipada con cámara).Con función GPS, también puede ser adecuado como dispositivo de navegación.Descripción:CPU: MTK 6580 Quad CoreRAM: 2G DDR3FLASH: 32GB Nand FlashSistema operativo: para Android 7.0Wifi: IEEE 802.11 b / g / nVelocidad del procesador: Quad Core, 1.3GHzPantalla: 10.1 pulgadas, 800 * 1280, interfaz MIPI, IPSPantalla táctil: P G, 5 puntos.Cámara: frontal: 5 mega pixel; trasera: 2 mega pixelInterfaz: 1. D.RAM ROM: 1GB 16GB ,1GB RAM promises that the tablet PC runs with a high speed and 16GB ROM provides large storage capacity for you to keep your favorite movies or music. Excelvan Mini Proyector HDMI 1080P LED Cine en casa PC&LaptopVGA/U. 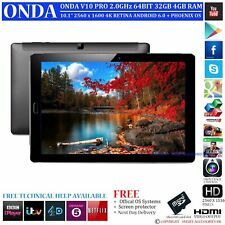 TABLET ENERGY PRO 4 10.1" FHD. Incluye la aplicación Energy Music para gestionar tu música por carpetas y que puedas ecualizar el sonido de manera óptima para tu dispositivo Energy. Conexión Wi-Fi 5 GHz. D.RAM ROM: 1GB 16GB ,1GB RAM promises that the tablet PC runs with a high speed and 16GB ROM provides large storage capacity for you to keep your favorite movies or music. The stated ROM amount shows the maximum available ROM with nothing installed. Features:CPU: MT6592, eight cores, clocked at 2GhzGPU: Mali-400Operating Memory (RAM): 4G DDR3Body memory: 64G Nand-Flash (can use the capacity of less than this value, because the mobile phone software space)Maximum storage expansion: TF card 64GNetwork mode: GSM / Type: 8-core 10-inch flat-panel computer MT6592 IPS dual-3G flat panel screenMemory Size-ROM :64GB ROM (internal storage tablet storage system used some storage),about 12.4GB can&nb. 3G:(WCDMA 2100MHz). USB HOST 2.0 high speed interface (Micro),Support Extra Hard Disk, Ethernet, 3G Dongle and other peripherals. 1 x Tablet PC. Tablet Weight Warranty Policy. Import duty. 1 x User Manual. Marca - Sin marca/Genérico - Modelo S101 3G MPN B010001611 EAN No aplicable Tipo Tablet Sistema operativo Android 5.0.X Lollipop Tamaño de pantalla 10,1" Resolución 1280 x 800 Capacidad de almacenamiento 16 GB RAM 1 GB Procesador Quad Core Color principal Oro Conexión a internet Wi-Fi 3G Conexiones Bluetooth Procesador Quad Core MarcaXGODY ModeloS101(100% NEW) Mostrar pantalla10.1" TFT LCD Display, 5-Point IPS Capacitive Touch Screen Resolución1280*800(Use different Software test may a little different, if any question, please contact us first) CPUMT6735 Quad Core, Up to 1.3GHz La frecuencia de la CPU598.0-1300.0MHz GPUMali-400 MP, Support 3D Games Tamaño de la memoria RAM1GB DDR3 Tamaño de la memoria ROM16GB (internal s.
Teclast 98 Octa Core Dual 4G Phablet. ● 3GB DDR3 RAM for Advanced Multitasking. ● MTK6753 64bit Octa Core 1.5GHz. 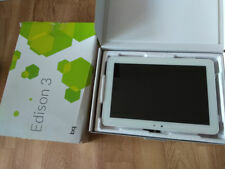 Teclast Tbook X3 Plus 11.6'PC. SCISHION V88 TV Box Android Quad Core 4K Mini PC. Cubot X18 Plus 5.99' 4G Smartphone. Questo tablet è pulito senza plug-in e con oltre 40 lingue per scegliere. Facile da usare. 3G: Supporta 3G spina. 3G; Supporta WCDMA, GSM connessione. Batteria: litio da 3.7V/5000mAh, abtteria ricaricabile( si risistema il tablet la prima volta si lo ricarica). USB Ladekabel. Asus ZenPad 10 - Luxus einer neuen Generation. Es ist elegant, dünn, leicht und durchdacht - gleichzeitig setzt es mit seinem Clutchbag-Look einzigartige Akzente. Wesentlich bei einem Tablet ist vor allem eines: das Display. TABLET 10.1 POLLICI CON 2g di RAM E 16 DI ROM. POSSIBILITA' DI TELEFONARE MENTRE SI ADOPERA IN RETE 3G (DOPPIA SIM) Caratteristiche •Schermo10.1 inches IPS , 1280*800 Capactitive five point touch screen •CPU MTK6580 Quad Core , 1.3Ghz RAM2GB Storage16GB •OS Google Android 6.0 •Lingua: Cinese semplice, Cinese tradizionale, Inglese, Francese, Tedesco, Italiano, Giapponese, Coreano etc. •NetworkWiFi: Built-in WiFi Module. IEEE 802.11b/g/n •Camera frontale 2.0MP, posteriore 5.0MP •G-Sensor4-Directions gravity sensing •Applicazioni MSN, Skype, Gmail, Apps from Android Market Office WORD, EXCEL, POWERPOINT, TXT, etc. •Speaker1W*8Ω •Bluetooth 4. El Saturno 10 Pro se ejecuta en Android 6.0 con un procesador de 1.3 Ghz con 1 GB de RAM y características construidos en Wi-Fi y altavoces. PARTÍCIPE RCA Saturno 10 PRO 10.1 "HD pantalla 32 gb 2 en 1 Android Tablet 6 Laptop Convertible. Procesador Rockchip RK3188 A9 de cuatro núcleos, 1,6 GHz, GPU: Malí 400 MP4. 2GB DDR3 32GB (espacio del sistema sobre 2.5GB) almacenamiento en tarjeta externa SD (no incluida) de hasta 32 GB. Android 4.4.2 Jelly Bean OS. The Onda V10 Pro is a beautifully designed ultra slim tablet with narrow bezels giving it a whole new feel. This tablet also features keyboard docking connections so you can convert it into a laptop with the optional genuine docking keyboard. Android 6.0.X Marshmallow. 3G:(WCDMA 2100MHz). USB HOST 2.0 high speed interface (Micro),Support Extra Hard Disk, Ethernet, 3G Dongle and other peripherals. 1 x Tablet PC. Tablet Weight Warranty Policy. Model: Hi9 Plus. - 1 x Chuwi Hi9 Tablet. Powerful Deca Core CPU up to 2.6GHz. - CPU: MT6797 (Helio X27) Deca Core up to 2.6GHz. - ROM: 64GB. - OS: Android 8.0. - 4G: FDD-LTE 800/850/900/1800/1900/2100/2600MHz. 4G LTE verdadera súper rápido. 2: 4G Byte LPDDR3. 4 GB de RAM. 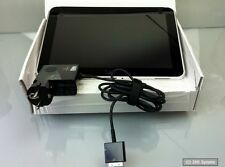 PC 1x Donjey Tablet. Android 6.0. Chiavette USB, Mouse, tastiera, ecc da collegare al PC tablet. FDD LTE: B1 B2 B7. TDD LTE: B38 B39 B40 B41.